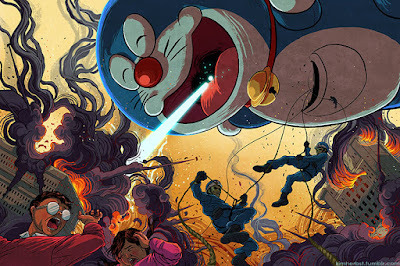 Imagine if Doraemon turned on Nobita's descendant and decided to go on a rampage in the past, to ensure he wasn't enslaved by the kid in the future. Doraemon's Revenge! - completed for "The Doraemon: Fujiko Fujio Tribute Art Show” at Q POP Gallery in Los Angeles, CA! This will be printed on wood board -15" x 10" for sale during the exhibition. Show runs from July 25th to August 16th!